Three more people, including two of the men named as bombing suspects, have been charged with conspiracy to murder people in the 21 July London attacks. Ibrahim Muktar Said, 27, is suspected of the failed Hackney bus bombing while Ramzi Mohamed, 23, is suspected of the attempted Oval Tube bombing. Manfo Kwaku Asiedu, 32, is charged over an unexploded device found at Little Wormwood Scrubs park in west London. Suspected Warren Street bomber Yassin Hassan Omar was charged on Saturday. In addition to the conspiracy to murder charge, Mr Said and Mr Mohamed, who were arrested in raids in west London on 29 July, and Mr Omar are accused of attempted murder, conspiracy to cause explosions and possession of an explosive substance. Mr Asiedu, of Finsbury Park, north London, is charged with conspiracy to murder and conspiracy to cause explosions. Two other men - Siraj Yassin Abdullah Ali and Wharbi Mohammed - were charged on Sunday with assisting in evading arrest. BBC home affairs correspondent Andy Tighe said the five men are due to appear at Bow Street Magistrates' Court, sitting at Belmarsh prison, in south-east London, on Monday. Mr Omar, 24, of New Southgate, London, who is also charged with attempting to murder passengers on 21 July, is also set to appear in court. A fourth suspected bomber, Osman Hussain - also known as Hamdi Issac - who is alleged to be the failed Shepherd's Bush bomber, is in custody in Italy. On Saturday, three men were remanded in custody after being charged under anti-terrorism laws in connection with the attempted bombings. Shadi Abdel Gadir, 22, and Omar Nagmeloin Almagboul, 20, both of Dyke Road, Brighton, and Mohamed Kabashi, 23, of Mary Magdalene Road, Brighton, have been accused of failing to disclose information about the failed bombings. The men appeared in court in central London. Six people have now been charged under the Terrorism Act 2000 with failing to disclose information that could have helped police investigating the July 21 attacks. The others are Yeshiemebet Girma, 28, who is the wife of suspected bomber Osman Hussain, her sister Mulumebet Girma, 21, and Ismael Abdurahman, 23. 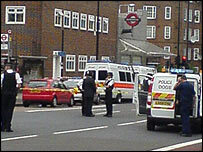 The failed 21 July attacks took place two weeks to the day after four suicide bombers killed 52 passengers on the London transport network.